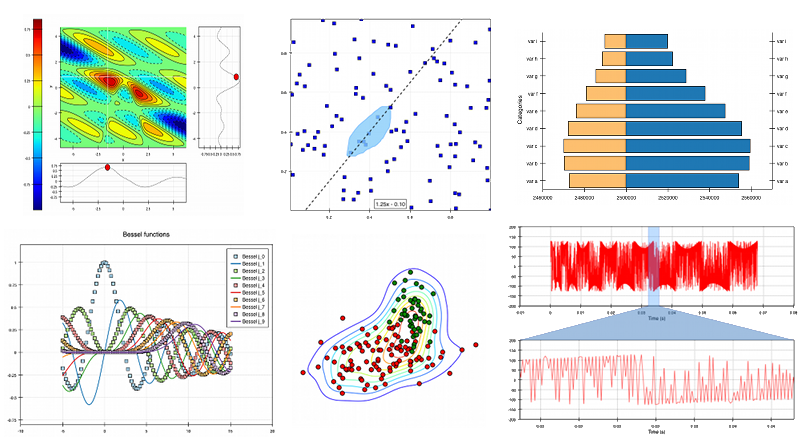 Chaco is a Python package for building interactive and custom 2-D plots and visualizations. Chaco facilitates writing plotting applications at all levels of complexity, from simple scripts with hard-coded data to large plotting programs with complex data interrelationships and a multitude of interactive tools. While Chaco generates attractive static plots for publication and presentation, it also works well for interactive data visualization and exploration. Chaco is part of the Enthought Tool Suite. Chaco includes renderers for many popular plot types, built-in implementations of common interactions with those plots, and a framework for extending and customizing plots and interactions. Chaco can also render graphics in a non-interactive fashion to images, in either raster or vector formats, and it has a subpackage for doing command-line plotting or simple scripting. For a quick sample of Chaco’s features, see the gallery, the annotated examples page, the tutorial and examples and the resources page. © Copyright 2008-2011, Enthought, Inc.. Last updated on Oct 14, 2013. Created using Sphinx 1.1.3.